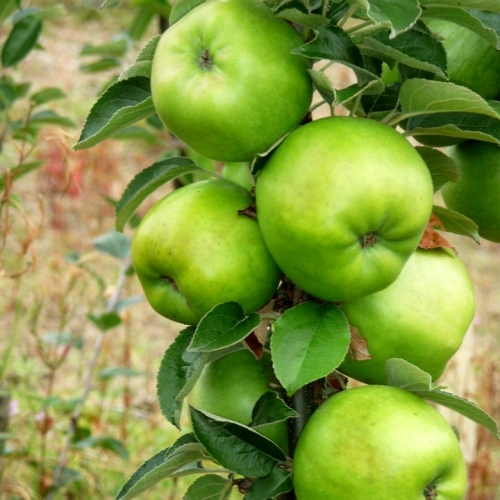 Fruit trees for sale | Cooking Apple Trees. Cooking Apple Lord Derby fruit trees - Raised by Mr Witham, Stockport, Cheshire in 1862. Grown commercially in the UK and also a very popular garden variety. Has vigorous upright growth, good cropper with good disease resistance. It succeeds in cold, wet areas. Fruit size is large with a light green colour. Does not store well. Picking time mid September. Pollination group 4. There is a number of reasons why I keep coming back to Blackmoor's; excellent quality stock, impeccable customer service and speedy dispatch. I honestly can not fault this superb retail business. I've now bought 14 cookers this year of which 7 have been trained into cordons. Well done. Very, Very impressed by the quality of the tree that I purchased from you. Looking forward to some lovely apple pies!